January 18, 2012, will still be talked about decades from now. It is the day tens of thousands of websites, including giants such as Google, Wikipedia and Reddit, decided to take a stand against what they see as a hostile takeover of the Internet by Hollywood, the recording industry, and other rightsholders. As it faces two draconian anti-piracy bills, the free Internet is at stake. Whatever the outcome may be, history is being made today. At TorrentFreak we’ve been covering copyright battles for more than half a decade. When a new anti-piracy bill emerges, wherever in the world, there has always been a push-back from civil rights groups and Internet users. Unfortunately, these protests are almost exclusively ignored by lawmakers. Could this pattern be broken today? Judging by the scope of today’s protests it’s now or never. 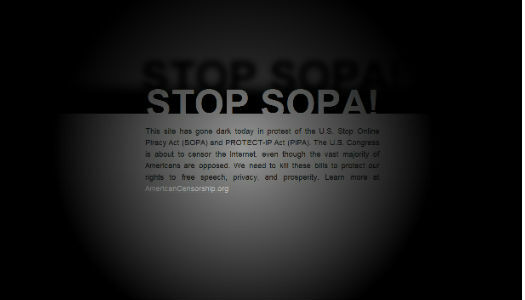 In the coming hours hundreds of millions of Internet users will be confronted with blacked out pages and similar “strikes” in opposition to the PIPA and SOPA bills, and if enough people take action the people in Washington may just listen. 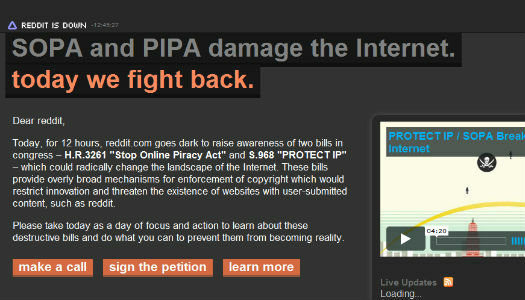 - Tell Congress you oppose PIPA/SOPA. - Not in the US? Email the State Department. - Leave your computer and visit a Senator. - Discuss, share and inform others about the bills. For those who are wondering, TorrentFreak is not going dark. Our purpose has always been to inform the public, whether it’s the latest news or a call to action like this article. We believe we can contribute and achieve more by keeping the site online than to black out completely. That said, we are alerting all visitors to take action through the excellent censorship script put together by FAT LAB. To save an impression of today for future generations, we’ve listed below a few of the many protest pages being run today. Did we miss a good one? Paste a link in the comment section and attach a screenshot! 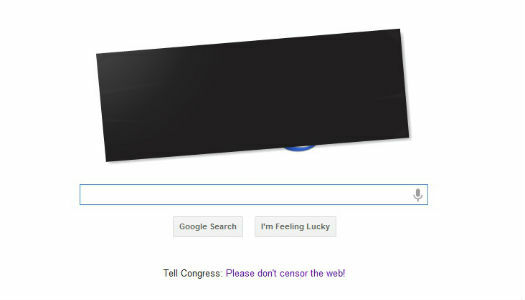 Google has blocked its logo to protest PIPA/SOPA and added a link to a resource page where people can take action. Demonoid, one of the largest BitTorrent communities, is going dark completely, with a nice spotlight effect. Firefox users will be welcomed with a dark themed default home page today, alerting people about the looming PIPA/SOPA threats. The online community Reddit will point the public to a resource site where they can take action. 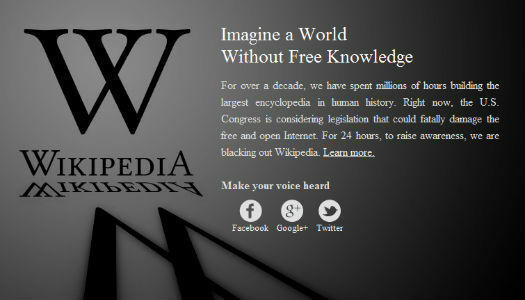 Wikipedia will be completely inaccessible for 24 hours, except the pages about censorship, PIPA and SOPA, of course. WordPress is joining the protest as well, and has decided to censor itself today. 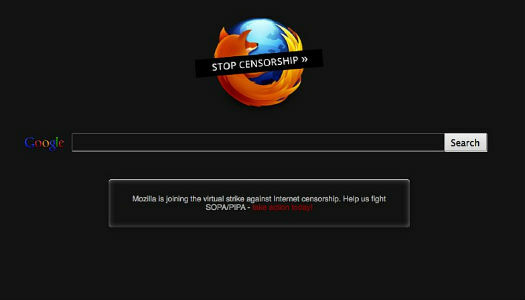 The Pirate Bay: PIPA/SOPA Won’t Stop Us! Wikipedia specifically says you can turn off your jcaasvript to get to their site, and it's okay. You don't have to feel like you're crossing the picket line.MadOldLady, do you really want to live in a world where you can get thrown in jail for 5 years, just for sending someone a link to a website? A website like youtube, that you didn't know had illegal material in some other part of it? Because that's what SOPA does. It makes it jail time for you to send out a link, if it turns out the website you linked to also let someone else post copyrighted material.Let's get our priorities straight here. Wikipedia is a free public service, and they can do whatever the hell they want. It's not censorship if they close their site for a day. They can close their site forever if they want to. That's their right. It's no one's right to say that posting a link to something means jail time. It's disgusting that anyone even thinks that's an acceptable answer to the piracy problem. Different styles and designs of wholesale new era hats are now available to make your wrist beautiful. You can choose from the wide variety of Wholesale red bull hats by comparing lots of perfect and stunning pieces.